Haven't heard from me in a while? That's because I now know what they mean by true Ironman training. I've had two previous seasons of training for Half Ironman races so I had grown used to the physical and rest demands of that training but not I am acquainting myself with full Ironman distance training. It's true, the only things I do are work, train, nap, sleep, and eat. I find myself taking a daily 30ish minute nap around lunchtime or at 5pm because I can't keep my eyes open any longer. Despite the grumbling, it's been a fairly fun and eventful three weeks of training. Coach Mary and Coach Mike hosted a training camp for their full and half IM athletes a few weeks ago in Blowing Rock, NC. It was a challenge for me, because as I have blogged before, I love to climb but hate to descend. 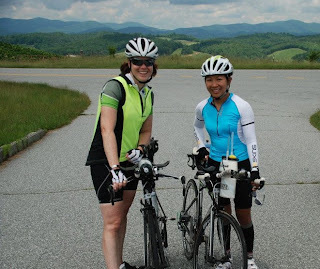 As it turns out, you are either climbing or descending on the Blue Ridge Parkway. Here are some photos. Climbing - that's why I'm smiling! Monika and I close to the end of our first day, long ride. Check out that scenery. ...and strength! Thankfully there isn't a picture of me doing flutter kicks. Pretty weak! Total mileage for training camp was 125+ miles on bike, 20+ miles running, detailed swim analysis, and some tired, sloppy pool and open water swimming. :) It was really nice to be with so many other athletes that are working towards their IM goals. Last weekend was our first 100 mile ride of the season and a 3 hr. 15 min. run. The ride went really well, our IM Canada group stuck together and finished in just over 6 hours. I did a 16.5 mile run with Sarah on Sunday - it didn't go so well but we made up for it by having burgers with the rest of the Canada crew at Moxie Burger. 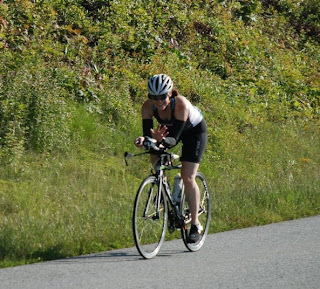 This week is recovery and I will be racing 11 Lake Oconee Olympic distance on Saturday. Racing during recovery? Yep. Evidently that's Ironman training.